Top quality folding stands for the professional or traveling student and make especially thoughtful gifts and pardon us if we brag a little ... Our music stands have been in the movies, Carnegie Recital Hall and Saturday Night Live, as well. Curser downward for more information and see our instrument stands and accessories too! As a musician, one of the most crucial tools you require for successful practices and performances is a sheet music stand. To assist budding musicians and well-seasoned performers, alike, TheMusicHouse.com offers a wide selection of portable music stands in a variety of styles and materials designed to dependably hold and organize your selection of sheet music. Select your perfect stand from the best selection of decorative music stands online. Made of fine woods or brass for the home, studio or stage, most of the desks extend or lower to accommodate the standing or seated musician. Some do not, but their measurements are available in their descriptions when you click on thumbnail images below. Music Stand - K&M 10062 "Robby Exclusive"
Our large variety of music stands are uniquely designed to fit your musical needs and can be utilized for several different uses and available at differing price points. Several designs are the ideal utilitarian portable music stands perfect for beginners and those wanting quick setup for afternoon music practices — available in several colors including black, nickel and even multi-color. For your convenience, many of our portable music stands have carrier bags. We also feature several ornately crafted music stands made from high-quality woods including walnut, mahogany, maple, oak and cherry and available in several finishes to match your personal style. These unique and stunning sheet music stands make delicate and elegant statements designed to enhance the beautiful music gracing their surfaces — great for home use or large concert hall performances. High-Quality Manhattan Music Stands - Perfect for Schools! For many that played an instrument in high school, they can probably recall the solid black music stands used to prop up new sheet music. 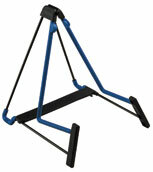 At TheMusicHouse.com, we supply those very same Manhasset music stands available in heavy-duty metal to ensure long-lasting quality for many aspiring youth musicians. These high-quality black, light-weight aluminum music stands are excellent for the school orchestra or band room and are elegant enough to transform into understated tools during performances. o keep your band room clean and organized, we also offer the Manhasset Rack 'n' Roll music stand cart that can easily store up to 25 music stands, has steel construction that adds durability for heavy-duty daily use and features wheels for easy maneuvering on any floor surface. In addition to our Manhasset music stands, we also offer other manufacturers including Belmont’s, Hamilton, Norwood and European Manufacturers such as K&M (Koenig and Meyer). Please feel free to email or call us for school and group discounts or if we can help you locate a special item you don’t see here. With the wide selection of music stands available at TheMusicHouse.com, you can easily find a stand that fits your daily musical needs and budget. If you need assistance locating the music stand that will best suit your expectations or want to learn more about our musical offerings, please give us a call today at 888-884-2533. 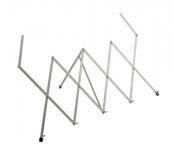 The well known Manhattan music stands in heavy duty Metal are excellent for the school orchestra or band room. Other manufacturers available include Belmonte, Hamilton, Norwood and European Manufacturers such as K&M (Koenig and Meyer).